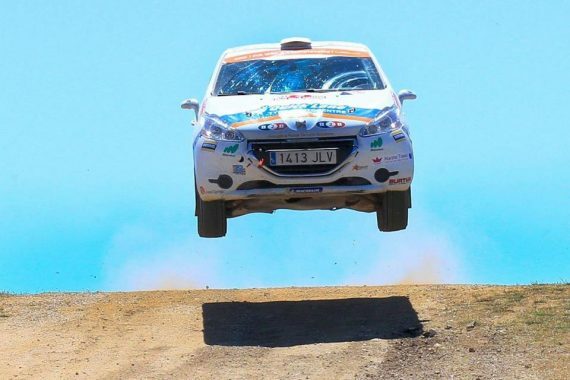 This weekend was the start of Louise Cook’s World Rally Championship campaign, on Rally Italia Sardegna based in Alghero. Louise is the only female driver in the entirety of the World Rally Championship. A team problem meant Louise had to change car last minute and to hire a different car; a 208 R2 from a Spanish team, Mavisa Sport. Louise, from Maidstone, only had a short 30 km test in the car before the rally. “It was a short test, we changed a few things on the car and the feeling was getting better. There was just not enough time to set up the car properly and get the confidence from it. It is such a different chassis to the Fiesta” said Louise. Louise’s problems started before the competitive section began. The recce car, which is a normal road car used to drive the stages at a restricted speed for the 2 passes to write a description of the road in the form of pacenotes, sadly broke down with an engine problem, meaning Louise did not manage to complete all of the 2 passes of the stages on the recce. At scrutineering for the rally car the 2” of padding installed in the base of the seat to allow Louise to see the road was deemed not allowed. This meant that Louise had a very difficult task to see the road ahead and led to a difficult view point on the tight and undulated stages. The first full day on Friday, the rally’s 2nd leg, involved extremely rough stages. The 2WD cars are far from the strength of the £600,000 main WRC cars, it was very important for Louise to save the car. On the 2nd loop on of Leg 2 a thunderstorm broke out, this made the stages treacherous on the narrow tracks. Louise kept out of trouble and ended the day 3rd from 8 drivers in RC4 class and 3rd in WRC3. On the 3rd leg, the stages were much wider allowing Louise a chance to explore the car more. “We had a good run through the Coiluna stage. I like the stage, despite retiring on the stage back in 2012 when a driveshaft broke and also my collar bone”. Louise set a 3rd fastest time through the Coiluna stage. On the 2nd stage of Saturday Louise lost a little time when catching the car in front that started with a 2 minute gap. Louise was having difficulty seeing the road with all the dust from the car in front and trying to find a way past. 2nd loop of leg 3 Louise had a hard landing on the man-made jump in Coiluna. The last day was purely about managing the pace for Louise. The 2 stages that were run twice on the Sunday are notoriously rough stages and with a 15 minute gap to 4th place, Louise steadied the pace to capture the 3rd place that had been held since Stage 6 of the 20 stage rally. Louise managed 8 x 3rd fastest times from the 20 stages on her debut in the new car and gained 15 points to start her WRC3 Championship campaign. This entry was posted	on Monday, June 11th, 2018 at 1:15 pm	and is filed under Featured, Motor Racing. You can follow any responses to this entry through the RSS 2.0 feed. Both comments and pings are currently closed.